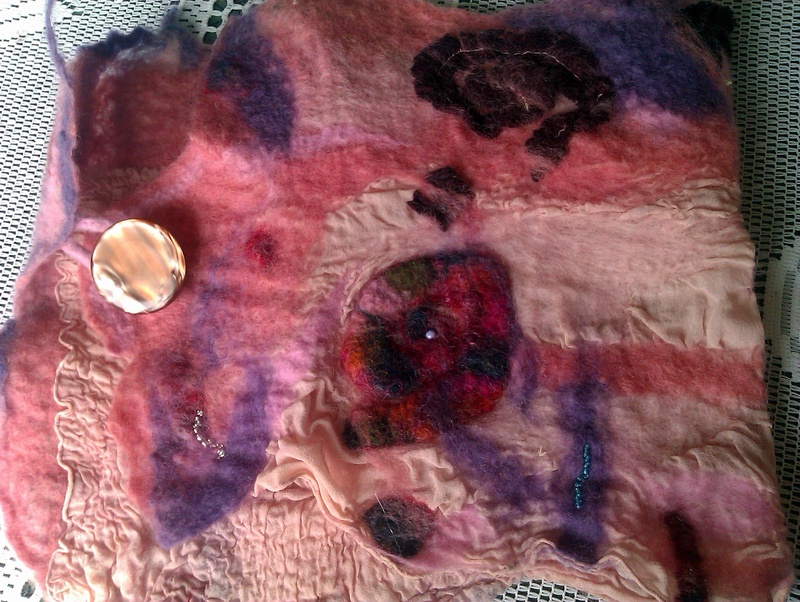 is the incredibly ancient and seemingly magical process of taking fluffy wool, adding warm water and soap, bashing the living daylights out of it and ending up with beautiful tactile wearable art. Felting occurs when fiber is moist, alkaline and physically agitated. The warm water and soap causes the scales to swell open, and the filaments knit together when massaged and agitated, the knotting then causes shrinkage which results in a dense strong felted fiber. Feltmaking is still practised by nomadic peoples (Altaic prople) in Central Asia and northern parts of East Asia (Mongols), where rugs, tents and clothing are regularly made. Some of these are traditional items, such as the classic yurt (Gers), while others are designed for the tourist market, such as decorated slippers. In the Western world, felt is widely used as a medium for expression in textile art as well as design, where it has significance as an ecological textile.